No, I'm not saying DON'T buy them. Far from it. I am absolutely obsessed with moisturising my face morning and night. I feel completely and utterly wrong if I don't. What I want to know here is what you think and what I think I ought to be paying for a moisturiser and what I think I'm getting out of that money. 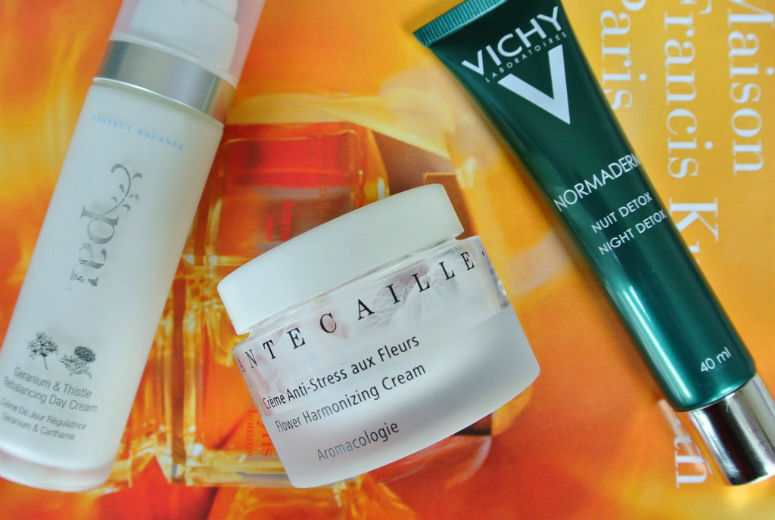 I've currently only got 3 moisturisers currently in use in my beauty cupboard at the moment: the Pai Geranium and Thistle Rebalancing Day Cream, the Chantecaille Flower Harmonizing Cream, and the Vichy Normaderm Night Detox Cream. These three cover the spectrum in price completely, with the Vichy starting the bar at £15.00 from Boots, and the Chantecaille cream selling at almost £90. Eighty-eight pounds to be exact. Eep. I bought it in a total moment of casual weakness when I was feeling a low about my skin and it was payday. The Chantecaille is just an extremely overpriced plain moisturiser in a pot, which doesn't really show up any results on my face, which makes that moment of weakness more irritating than ever. I'll keep on using it until I finish but I definitely can't wait for it to be used up so that I can make space for something more worthwhile. In total contrast to this, the Vichy night cream is probably the best moisturiser I have ever used. I use it as directed as a night cream, and I am so happy that I made space for this tube of goodness in my cupboard. Since I've introduced it into my skincare, the number of spots I get has reduced, it absorbs quickly into my skin, and all the while still feels hydrated. Don't get me wrong, I am not blemish free completely, and I don't think I ever will, but I truly believe this is helping, and I think I'll always make sure to have a tube in the cupboard as backup. As for the Pai day cream, this comes in at £34 and is a perfectly nice moisturiser for the day, but has one problem for me: the smell. It's a really strange smell, one I can't really describe, other than it makes me think of saliva? I know, that sounds absolutely horrible, but I can't think of anything else when I put it on. I'm hoping it was just the tube I got, because it's nice enough to use. I think I will go back and see if it smells any different, but there are a few other creams I want to try out anyway, so this is not high on my repurchasing list. So there you have it: my experience of the price spectrum of moisturisers. I think moisturisers, as with all beauty, is very subjective, so if you find one that is working for you, then stick to it, but for me, I've proved to myself that expensive isn't always the way to go.